By a decree of Saint John Paul II, the Roman Catholic Diocese of Wrexham was erected on the 12th February 1987 from territory of the diocese of Menevia. 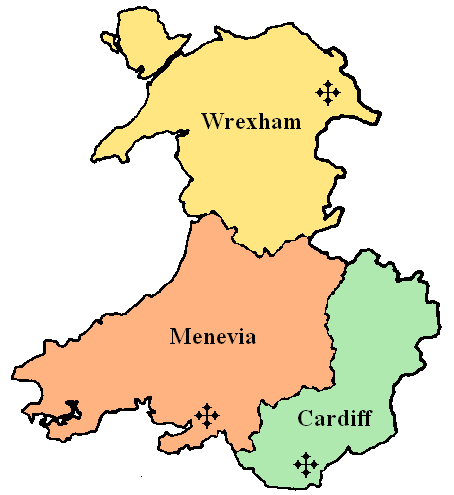 The Diocese of Wrexham covers the North and parts of Mid-Wales, specifically the ancient counties of Anglesey, Caernarfonshire, Denbighshire, Flintshire, Merionethshire and Montgomeryshire (the local government areas of Conwy, Anglesey, Denbighshire and Flintshire, Gwynedd, Wrexham and the former Montgomeryshire). The diocese covers an area of 8,361 km². The diocese is a suffragan of the Archdiocese of Cardiff and along with neighbouring Menevia forms the province of Cardif, Wales and Herefordshire. The see is in the town of Wrexham where the seat is located at the Cathedral Church of Our Lady of Sorrows. On 27 June 2012, the Holy See named Peter Brignall as third Bishop of Wrexham. At the time of his appointment, Monsignor Brignall was already Wrexham's Vicar General. Bishop Peter's episcopal ordination took place on 12 September 2012 in Wrexham Cathedral. Bishop Peter succeeded the retiring bishop, the Rt Revd Edwin Regan who had served as 2nd bishop since 7th November 1994. The first bishop had been James Hannigan. 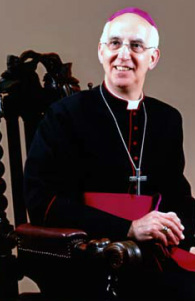 Bishop Hannigan was originally the Bishop of Menevia from 13th October 1983 and became the first bishop of Wrexham when the diocese was was erected. He was bishop from 12th February 1987 to 7th March 1994; he died in office.